We would drink tea 15 times per day because a plate full of cookies was always standing at the kitchen table - impossible to pass by. Then we put them in pretty present boxes for friends and friend of friends and stocked the freezer - for a rainy day. These cinnamon rolls are among our big favorites and will hopefully be only the first in a whole series of cookies this year. There is nothing complicated about making them. They are for fun and pleasure only. Recipe came into my hands many years ago from a Burda fashion magazine (at that time it was probably the most reputable recipe source I used). It was so good that it stayed with us till now. Mix together butter, cottage cheese and sugar to get even texture. Then add the egg yolk and vanilla and mix again. Mix the flour and baking powder. Gradually add the flour to the wet ingredients, mixing with a spatula and then with your hands (when the pastry gets firm). The final texture should be rollable, so the pastry needs to get plastic and stop sticking to your fingers. Place the pastry between two sheets of baking paper and roll 0.5 cm thick. Paper is optional, but it really makes things easier, especially for rolling in the filling afterwards. Give the pastry layer approximate rectangular shape, around 20 cm wide. Spread the melted butter over the pastry leaving 1-2 cm edge from one of the long sides untouched. Mix the 4 tbs sugar with cinnamon and spread around 3/4 of the mixture over the pastry. Make a roll starting from one of the long sides. Start with your fingers, but when it gets going you can just pull the paper to finalize rolling. Brush the outside of the roll with butter and sprinkle with the rest of the cinnamon sugar. Freeze for 1 hour. 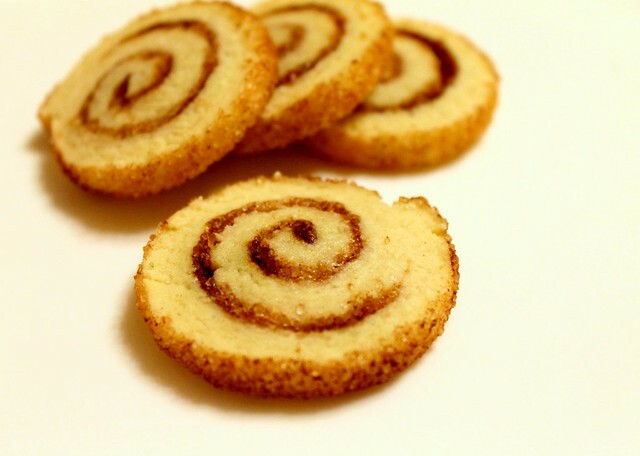 Cut the roll into cookies 0.5 cm thick and place them on a baking sheet covered with baking paper. Bake at 190C for 10 minutes. Take out and let cool on a rack, but make sure to try at least one while they are still warm. They keep well in a plastic bag. If you need to store them for over 1 week it is better to use the freezer. Wow, those look so perfect. I'm adding them to my Christmas baking!